Queen Charlotte Lodge, located on the northern coast of Haida Gwaii, is the ultimate sport-fishing adventure. Thirty pounds: it doesn’t sound like too much of a burden. But when it’s thrashing and jumping on the end of 18 metres of thin nylon line as your boat rises and falls in a two-metre swell—well, 30 pounds might as well be a full-sized car. Such is the challenge at Queen Charlotte Lodge, where a 30-pound chinook salmon—“tyee”, to use the cant of the Northwest Coast—is the catch of the day. Located in Naden Harbour, a sheltered inlet on Graham Island, the largest of the Haida Gwaii (the Queen Charlotte Islands, in colonial nomenclature), the lodge provides an extraordinary opportunity to get up close and personal with Oncorhynchus tshawytscha. Getting there can be a bit of a challenge. Roads being in short supply in this neck of the woods, guests arrive via a dramatic 15-minute helicopter ride from the village of Masset, itself a two-and-a-half-hour flight north from Vancouver. Then again, nothing worthwhile comes without effort. While you’re skimming over a postcard-perfect landscape of wild waves and untouched timberland, it’s hard to shake the feeling you have come to the edge of the world—a place where nature lives, but humans merely visit. Every fisherman has a story to tell; every fishing lodge, too. In the case of Queen Charlotte Lodge, its story begins a century ago, when intrepid seafarers brought 70-tonne fin whales and 45-tonne sperm whales back to Naden Harbour for processing. The whaling station closed in 1943, but its ghosts remain: the concrete debris of a large chimney stack from an old drying kiln rises like an obelisk on the shoreline in front of the floating dock, and huge iron wheels and gears rust slowly among the cedars and spruces surrounding the resort. As a tourist destination, the lodge’s story begins in 1991. Back then, the lodge was little more than a crash pad for hard-core anglers—a place to come back to when the sun went down or the bait ran low. 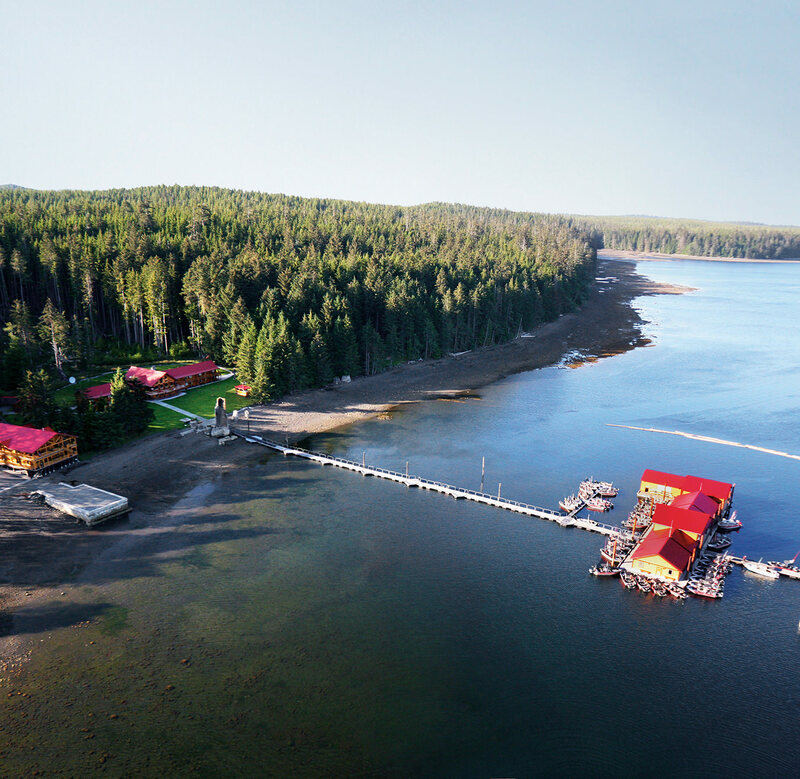 In the 20 years since, it has been transformed into a five-star getaway for the backwoods set, with amenities every bit as impressive as the supersized chinook routinely hauled out of the surrounding waters. 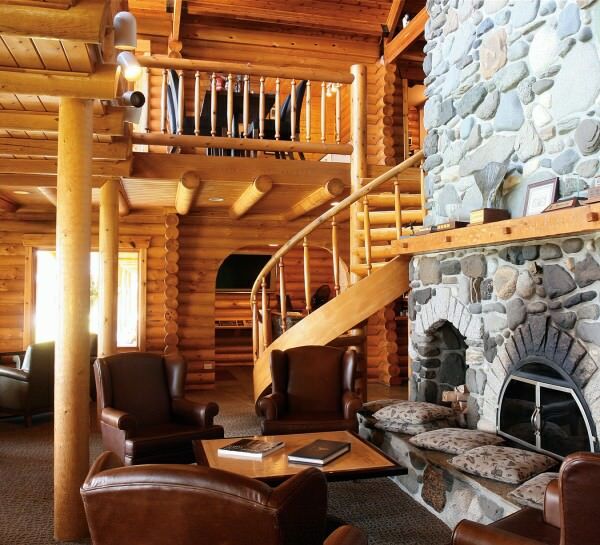 Rooms in the main lodge are spacious and comfortable, with exposed log siding and rough stonework firmly in keeping with the rustic style. The newest residence, Totem House, is a four-suite lodge that offers tailored services, including a personal chef and hostess, for large groups or those seeking a little privacy. The main lodge, made of B.C. lodgepole pine. As impressive as it all is, you don’t come to Queen Charlotte Lodge to admire the architecture. A 20-minute ride in one of the lodge’s speedboats gets you to the celebrated fishing grounds surrounding Graham Island; set your line with herring or anchovy and you should have a bite or two within the hour. The mighty chinook is the top prize, but coho salmon (renowned for its fight), Pacific halibut (renowned for its flavour), and a variety of rockfish are abundant. While you wait, you can watch nature’s anglers: the eagles, ravens, bears, sea lions, and orcas that have come here to grab a piece of the action. When the lunch bell rings, you can head back to one of the lodge’s most attractive features: the MV Driftwood, a 33-metre ocean tug dating back to the Second World War that has been converted into a floating canteen. The ship serves as an operations centre and refueling station for guests, with homemade burgers, from-scratch chowder, and other treats available on the aft deck. True fanatics can bunk on the MV Driftwood for the duration of their stay, giving them the opportunity to drop their lines at first light. A trip to the old Haida village of Kung offers a reward of a different kind. Located on a picturesque white-sand crescent beach about a five-minute boat ride from the lodge, the village was once home to a community of 300 Haida. All that remains is a collection of fallen beams, posts, and mortuary poles, along with a number of half-filled pits where massive longhouses once stood. Abandoned by 1890, the village has now almost returned to the earth; the decaying posts, poles, and beams are a garden for ferns and Sitka spruce saplings. Listening to the waves lap against the lodge’s pebbled beach, watching the eagles swoop and whirl in the North Pacific wind as you step softly among the spirits of another age, you think to yourself: this is surely the trophy of the trip—no matter what you manage to haul on the end of the line.